To earn your ideal, you don't just need to nail your workouts. You've GOT to get flawless, balanced nutrition– even on your busiest "yoga-pants-and-messy-bun" days. 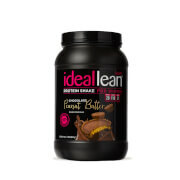 Fuel your active, on-the-go lifestyle with delicious IdealLean Meal Replacement Shake. And yes, you're rocking that messy bun girl. Protein Blend (Whey Protein Concentrate, Whey Protein Isolate, Micellar Casein, Hydrolyzed Bovine Collagen), Oat Flour, Sunfower Oil Creamer, Isomalto-Oligosaccharides, Cocoa Powder (processed with alkali), Sweet Potato Powder, Inulin (from Chicory), Gum Arabic, Natural & Artfcial Flavors, Medium Chain Triglyceride Oil Powder, Flaxseed Powder, Salt (Sodium Chloride), Xanthan Gum, White Chia Powder, Sucralose. I drink this every morning to replace my breakfast and I couldn't be happier!! I save so much money by not having to buy breakfast each morning and it keeps me full from 7:00am to around 12:00pm in the afternoon! The shake tastes great and is super convenient to grab and go in the morning! I would definitely recommend this product! I have been using this product for awhile. It taste good, and is great for my morning workout at the gym. But I wish there were other flavors to try of this. There should be something new. I am tired of the chocolate and vanilla. Also the cost should be lowered too. Okay so here's the skinny...get this shake. You will not be disappointed! 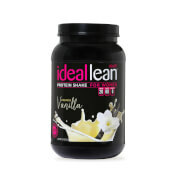 This is the best protein/meal replacement shake that I have every tasted. 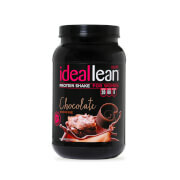 If you like chocolate and you are looking for a meal replacement drink, you will be very very pleased with the shake. The taste is a chocolate milkshake, seriously. And no after taste. I mix mine with 2 tbsp of peanut butter (powder form, which minimizes the fat, yes there is such a thing) and ground flaxseed, blend (not shake because of the flaxseed) and viola! A perfect morning shake. This is what I now eat for breakfast and I don't miss my muffins, or eggs, or cereal, or anything other breakfast foods you can think of. What kind of review would this be if I didn't give you a con. My only con which has no reflection on the product itself is that it doesn't keep me full. I assume my metabolism is so fast that it is digested in no time. Some review i've read said that they are full until lunchtime and I am not. But that's my own problem. Ha! Please don't hesitate to get this shake. You will love it. I'm not quite sure how they pulled it off but they did. I am very very happy with my purchase and will continue to purchase even once I reach my targeted weight and tone. I have been using this replacement shake for about a month now. It is AMAZING! Surprisingly it really keeps me full, probably because of the oats in it. The taste is second to NONE on the market. If you're one to worry about the taste, this is not a product to worry about. I've also been seeing great results with having this in my diet, which is easy to stay on track on at least one of my meals. It's also a relief to know i'm getting in a good amount of protein and the right amount of carbs in with this meal replacement. I will be buying again and again! I can't thank you enough for this!! Tastes great and we'll worth give price!! I use it in the morning before work and it lasts until lunch! It's perfect! The flavor is great! I have some difficulty mixing all of the powder fully, but the flavor and consistency are better than other protein shakes I’ve had. This shake grew on me. At first I was like no I can't drink that but then I changed it up the next day with some ice and blended it really well (good 4mins) and it wasn't bad. You have to drink it immediately while still cold and blended. It does get like gritty (I guess you can say) on the bottom (I think its the protein they use). I do have to say though this shake keeps you full! I have it in the morning around 7 and by 11 I am still full. I also did some chocolate banana protein muffins and those were great too! This is a great product! I would definitely recommend it!! Meal replacement fills me up and takes the hunger away. It also gives me the boost of energy I need.